Things must be loosening up in Cuba now that Raul Castro has taken over for his brother Fidel. 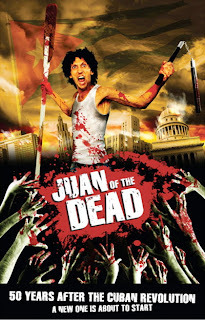 How else to explain the Cuban/Spanish coproduction JUAN OF THE DEAD, a zombie comedy that isn't afraid to satirize the communist island country? Instead being thrown in prison and having his film suppressed, writer/director Alejandro Brugués has instead seen his work make the rounds of the international festival circuit, achieving a fair amount of praise in both horror and arthouse circles along the way. The film focuses on small-time criminal Juan (Alexis Díaz de Villegas) and his best friend Lazaro (Jorge Molino). When the dead start rising, it doesn't take long before these two start working on an angle to make money off of the situation. Juan and Lazaro join forces with Lazaro's son Vladi (Andros Perugorría) and a couple of criminal associates to hire themselves out as the zombie equivalent of the Ghostbusters, despite not being very good at the job. Along the way, Juan also tries to reconcile with his estranged daughter Camila (Andrea Duro). From there, it's more or less the same plot as every other zombie movie as the gang slowly dwindles in numbers. 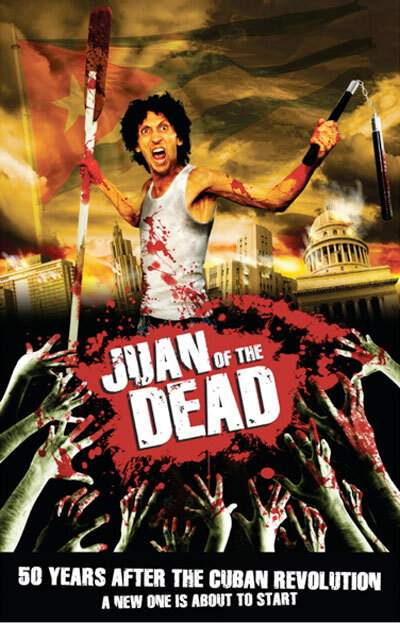 Although clearly modeled after the 2004 British horror/comedy SHAUN OF THE DEAD, JUAN has a distinctive flavor all its own. Obviously the aforementioned social commentary about life in Cuba is a big part of that, with the government trying to convince the population that the living dead are actually U.S. sponsored dissidents. Also setting the film apart, although not necessarily in a good way, is the unlikability of most of its characters. Juan occasionally shows a brief flash of decency, just enough to keep the audience marginally on his side, but to put it bluntly, he and his crew are all assholes with the exception of Camila. The persistent undertone of casual homophobia that runs through the movie didn't exactly help endear it to me, either. None of that is enough to completely spoil my enjoyment of the film, but it does diminish it. That still makes this arguably the best zombie film in the last decade. Granted, the competition hasn't exactly been strong, but thanks to its cultural peculiarities and obvious love for the genre, this would still be a film worth watching even in better times for the cinematic undead. For the horror fans who take such things into account, the gore is kind of mild by zombie film standards, and a lot of it is done with CGI. Despite the obvious inspiration of SHAUN OF THE DEAD (the dynamic of Juan and Lazaro's friendship is similar to that of Shaun and Ed, and instead of trying to reconcile with an old girlfriend, Juan is trying to regain the love and respect of his daughter), there aren't a whole lot of obvious, annoying winks at other movies. It's not great, but if you're a horror fan it's a decent enough bit of entertainment. 2 1/2 out of 4 stars.